Kleemann, the unofficial aftermarket “Kings of Kompressors” from Denmark, have released their 63-K2 tuning package for the already potent Mercedes-Benz CLK 63 AMG Black Series. 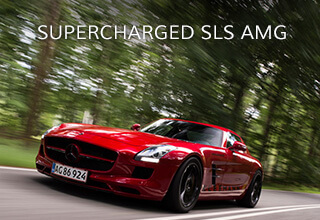 Unlike their usual high powered forced induced performance builds, this latest application stays true to the original AMG formula and remains in naturally aspirated form. Under the lightweight aluminum hood lies the heart of the Kleeman beast. Engineers first reworked the car’s exhaust system by installing a high-flow unit complete with matching downpipes. 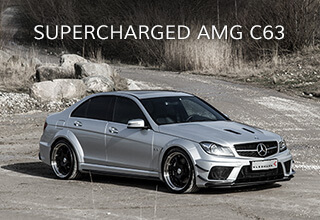 Next, a set of 200-cell steel sport catalysts were integrated into the exhaust package that not only allow for more breathing room and power, but also give a deeper, more menacing growl to the AMG coupe. Topping off the under hood performance mods is a remapped ECU designed to keep all the new components in proper working order. 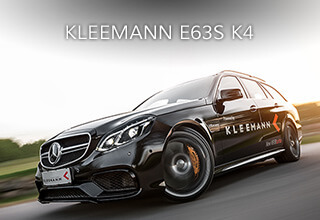 All told, the Kleeman 63-K2 bumps up the stock 500 horsepower and 478 lb-ft of torque by 45 horses and 20 lb-ft. Although no claimed straight line numbers were given, we’re guessing the Kleeman edition Black Series can easily best our stock 4.2 sec. 0 to 60 mph times. Exterior appointments are little, with only a set of taller and wider 20-in. three piece TS-6 wheels and a Kleeman logo kit giving any indication this CLK Black Series is anything but stock. 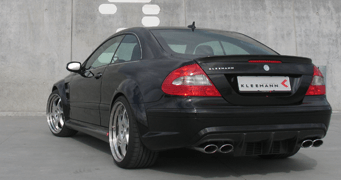 All enhancements by Kleeman for the Mercedes-Benz CLK 63 AMG Black Series are currently available at authorized worldwide distributors.